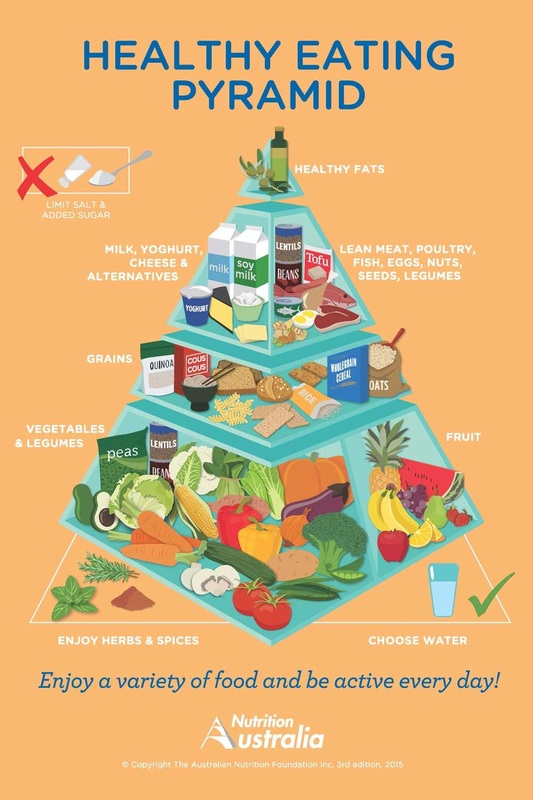 The post where I talk about the Healthy Eating Pyramid..
I’ve been annoyed by the old pyramid (below) for SUCH a long time. There was so much weighting on heavy carbohydrates, a fairly decent allowance for junk/crap foods and demonisation of fats, healthy or otherwise. You see it? All of the amazing-ness? The food pyramid is now separated into five sections… way better than just three! This gives us a much clearer picture of what a healthy diet should look like. You know what I’d love? To turn it upside down! We read from top to bottom and I think it would help to see/read the ‘eat most’ section at the top. But hey, Healthy Upside-Down Food Triangle doesn’t have the same ring to it. The new food pyramid very clearly gives veggies precedence over breads and cereals. Finally! There’s so many greens. From a guess, I can identify bok choy, pak choi, green beans, broccoli, zucchini, basil, rosemary and lettuce – GREEEENS for the win. More nutrient-dense whole grains are included. Like quinoa, cous cous, soba noodles and oats. Carbs are your friend. Fruits and veg have different weighting. The new food pyramid calls for about three times as many veggies as whole fruit. This is exactly what I do with my kids, myself and my PT clients – quality proteins and filling up on veggies first. There’s no junk food at all. Not even in the “sometimes” area like the original food pyramid. Actual REAL food for the masses, yeah! Good fats are actually named up as good. The old food pyramid has margarine and reduced-fat spreads in the “sometimes” food. Now this spot is reserved for healthy fats like olive oil and almonds. Spices and herbs have been included. There’s no allowance for added sugars. What’s the bad news then? Hmm, there isn’t much. Not really. For a generic suggestion that needs to be broad enough to cover a whole country and therefore can’t possibly take into consideration each individual’s needs and reactions, it’s pretty great in general terms. If I were being really picky, I am still a little iffy on processed soy products like tofu. I don’t do soy at all and with clients who feel they need these in their diets I prefer they lean to the less-processed soy products. And personally, I run better on a much higher fat ratio in my diet. But hey – such an improvement. So, that’s my thoughts on the new food pyramid, now I’m interested to hear yours. Sing out in the comments!